Set on the banks of the River Clyde, between two valleys and surrounded by woodland, New Lanark Heritage Village is a great day out for all the family. Now a recognised UNESCO World Heritage site, the restored 18th Century cotton mill still has a population of residents on site, small businesses, a visitors centre, hostel and hotel. Caroline, Mara and myself had a great few hours strolling around the exhibitions and attractions. Established in the late 1700's, New Lanark was built in the hope that the Falls of Clyde would power the mill. It was a hope that paid off, and for nearly 200 years the mill manufactured cotton. The Visitor Centre experience allows you to take a look inside the mill buildings, school, and the tenements where the mill workers themselves lived. There is also a roof garden giving spectacular views of the valleys, the Clyde and a view of the whole village from a different perspective. We moved from Mill 3 over to the tenements where the staff lived. It was crazy to think that in one room there could be upwards of 10 people living there at any given time. It was during this part of the tour that Mara decided she was hungry so we had to excuse ourselves from the rest of the group and go for lunch. The café is sited upstairs in Mill 3, with an easy access ramp for wheelchairs and buggies. There is a lot to choose from, from soup and sandwiches to hot meals, cakes and coffees. Caroline had a tuna mayo baked potato, I had the days special pulled pork panini, Mara had her packed lunch that we brought but we bought her some jelly too. From there we headed back outside and took a walk around the grounds. We had hoped to get up close the Falls of Clyde for a better look, but the path seemed inaccessible for a buggy - unless there was another route we weren't aware of. We hit the kids play park for a bit before nipping back into the visitor centre to go to the Annie McLeod experience. En route, we passed the rather impressive donkey engine, which was used to power the mill when the Clyde froze over in winter. The Annie McLeod Experience is told by the ghost of a young girl called Annie McLeod, a mill worker from 1820 who shares the story of her life with you as if you were really there in that time. Set in darkness, you are strapped into a carriage suspended from the ceiling on a rail that slowly guides you around, while holograms of Annie and her family are played to you with Annie telling you her story about life and work in the village. The ride lasts around 8 minutes and may not be suitable for those with claustrophobia or those afraid of the dark. Also not ideal for little children, as we found out the hard way half way through when Mara decided she wanted off! It is a very insightful experience though and definitely worth it. After the ride was done, we made our way up to the roof garden which is beautifully maintained with breath taking views of the surrounding area. On our way out we stopped off at The Mill Shop which has lots of Scottish products on sale as well as toys, homeware and other locally produced items, but the main attraction is really the wool which is produced on site. Fun Fact - The wool produced at the New Lanark Mill was used to create the Christmas jumpers made by Mrs Weasley in the Harry Potter films. How is that for a claim to fame?! We concluded our visit with a couple of ice cream cones by the side of the river overlooking the Falls of Clyde before heading back up the hill to the car. As well as all the usual things that New Lanark has to offer, there are also various events held throughout the year too. When we visited they were gearing up for some fun Easter activities. The next major event on the horizon is the LEGO Brick City Exhibiton. Held from June 28th to August 9th 2017, Brick City will allow you to "see the world in Lego Bricks." Another bonus feature of this event is that it is also Autism Friendly. They'll be offering quiet, sensory friendly morning sessions with very limited capacity (check website for details.) If you're a fan of LEGO, it sounds like an amazing event that shouldn't be missed. One last thing I should mention. New Lanark is not that far away, especially if you live in the Central Belt. We live in Longridge, West Lothian, and it took us around 25 minutes to travel to New Lanark. It was a great drive through the country side on a lovely spring day! 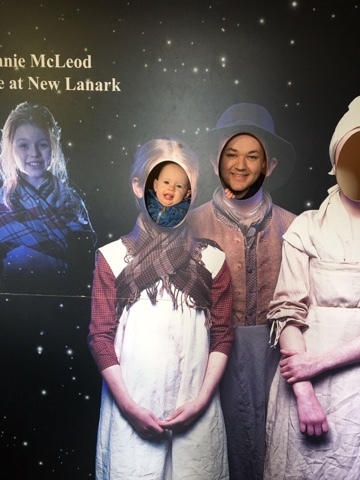 Thank you to Melissa from New Lanark Heritage Village for the opportunity to visit and review. 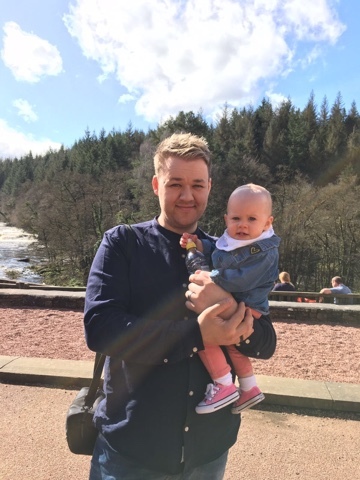 If you fancy a day trip to New Lanark Heritage Village yourself, I have a free Family Pass up for grabs! A Family Pass covers 2 adults and 2 children under 16 (under 3's are free.) To enter, click the FAMILY PASS GIVEAWAY link below. Thanks for reading and Good Luck! Competition ends on Sunday May 14th 2017 and I will contact the winner.